Toyota's US unit has officially marked the opening of the once-mothballed Toyota Motor Manufacturing, Mississippi (TMMMS) plant. 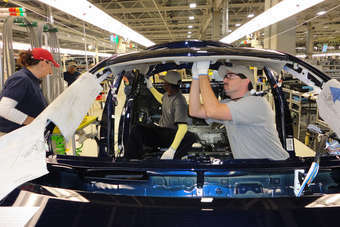 The $800m factory outside Tupelo - built in 2007-2009 and originally intended to build the Highlander [Kluger] SUV and then the Prius - has ended up assembling the Corolla after the joint venture plant with GM in Fremont, California, that made that model was closed in 2010. Toyota also builds North American Corollas in Canada. The Mississippi opening celebration was attended by Toyota Motor Corporation president Akio Toyoda and state governor Haley Barbour. TMMMS is Toyota’s 14th North American plant, and part of the company's strategy to design, develop and build vehicles where they are sold. The plant has annual capacity of 150,000 vehicles and will employ nearly 2,000. Toyota’s Buffalo, West Virginia, engine plant is supplying all engines for Corolla production at TMMMS. Cylinder heads and blocks for those engines are produced at both of Toyota’s Bodine Aluminum castings plants, located in Troy, Missouri, and Jackson, Tennessee.